A monthly donation from your credit card or checking account of $10, $100, $1,000 — or whatever you can afford — will give Harvest of Hope Pantry the stability we need to consistently fight food insecurity in Boulder! Your food donations, large or small, really do make a difference! Donations are accepted at the pantry, Monday – Friday, 9 AM – 2 PM. We cannot accept food that has already been opened, bulk items that need repackaging, or anything made outside of a commercial kitchen. We regularly update our Shopping List based on our current needs. We love fresh produce! If you have a garden that is over-abundant, please send it our way. Even the smallest amount is wonderful and brightens someone’s day and meal. Are you going on vacation and can’t use your CSA? Send it our way. We’ll find a good home for all of those fruits and veggies. Bring in your non-perishable canned, jarred,boxed and bagged products. *They must be unopened, unused, and sealed. *We can accept expiration dates that are less than a year past the marked expiration date on canned items. Please don’t let your pantry and fresh items go to waste as you venture to a new home. If your items are newer, unopened, and have expiration dates that are less than 1 year past the expiration date marked, please bring them in! 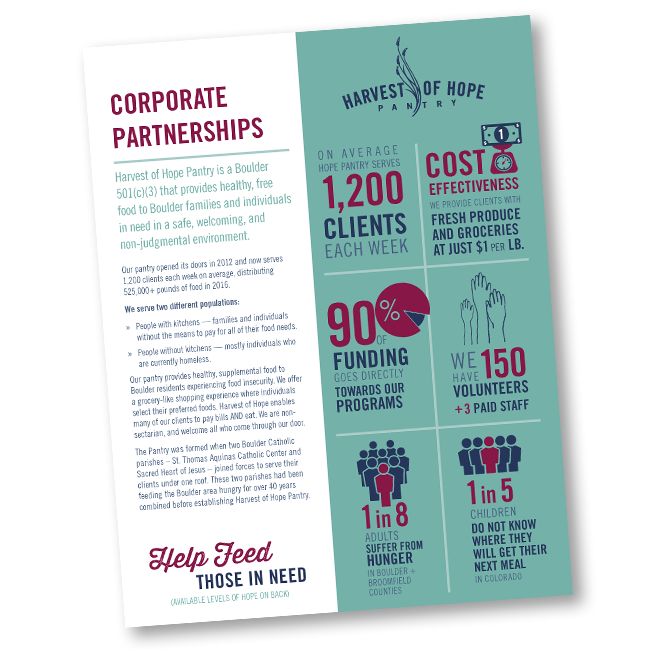 Corporate Partnership with Harvest of Hope Pantry provides a meaningful marketing and network platform for our partners, while simultaneously supporting a crucial program for residents in Boulder. Our Partners are provided with various opportunities to connect with a vibrant community of supporters, including Harvest of Hope volunteers and donors, many of whom are business owners in the area from upper income households. Harvest of Hope Pantry is a 501(c)(3) charity with EIN # 27-4010250. Your donations are tax deductible and you will be given a receipt for your gift. Thank you for your generous support!